You are here: Home » How predictive is the AP poll for Marquette? How predictive is the AP poll for Marquette? The AP will release its poll. Twitter will rise up in anger over so and so being too low and so and so’s rival being overrated. In response to that response a chorus of Tweets will ensue about how it’s just a meaningless poll and people should stop obsessing over it. Back and forth they will go for a week until it starts all over again. Admit it, this the college basketball season in a nutshell. When it comes to official preseason AP poll, the din is overwhelming. For starter’s it’s the first one so poll fatigue has yet to set in. Fans and media members alike have waited an eternity to able to discuss college basketball substance that doesn’t include injuries, suspensions or being shot out of a cannon while eating hot dogs as B.O.B. performs live. Nearly every outlet has put out a ranking of some type, so this is a good way to draw up content by making comparisons. The initial poll is also so contentious because it’s based completely on projection. Yes, getting the best recruiting class in the nation or the surest thing since LeBron James means you will probably be pretty good, but no one knows for sure. This AP poll is full of shoulds and coulds, making it a prime target to be pored over and destroyed. 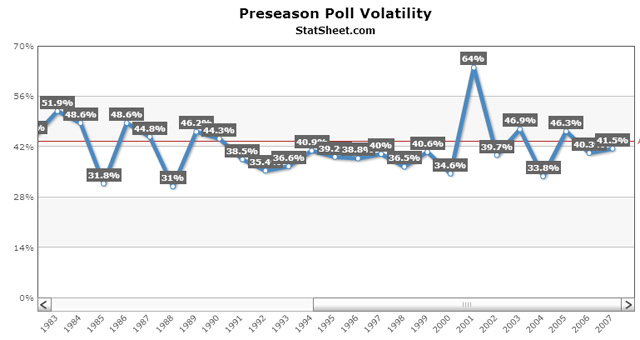 Indeed, the graph above from Statsheet.com shows the volatility between the first and final AP polls the past 20 years. More often than not, where a team started won’t be where it finishes. However, when it comes to basketball and statistics, no one does it better than Ken Pomeroy. He of kenpom.com has helped develop advanced statistics from a fun pastime for really smart people to basic knowledge for coaches and fans. Believe it or not, he’s a big fan of the preseason poll. You might be surprised to hear this, but I’m a big fan of the pre-season AP poll. There is no doubt poll participants have their biases in the pre-season. They may tend to over-estimate the importance of the previous postseason, especially when a team needed more than its fair share of luck to advance. But otherwise, whatever biases are present are uniquely individual, and in the collection of 70 or so ballots, those biases are cancelled out, leaving a useful signal. The end result is that it provides a better picture of the state of college hoops before the season begins than any single person or algorithm could produce. It’s informed groupthink at its finest. The post is almost three years old but everything he says still holds so I highly encourage you to read the whole thing for yourself. To flesh out those claims, we dug into the record books to see how Marquette performed when it started or finished the year ranked in the top 25. The average ranking for Marquette to start the season is 12.2 all-time (when ranked at all), and 17.7 this century. Only once has Marquette made it past the Sweet 16 without being ranked to start the year and that came last season. 13 times has Marquette finished better than its preseason ranking, 11 times it’s finished lower, and twice it finished where it started. Marquette has never started or finished a season ranked higher than No. 2 in the AP poll. Only six times has Marquette started the season unranked and finished in the top-25. It’s foolish to dismiss the early poll. Not only does it provide a fairly accurate gauge as to who should be good this season, it is crucial for television viewership purposes. I’ve gone in depth about how high TV ratings will be tough to come by for FOX Sports 1 without multiple good to great teams in the Big East and the chart above confirms it. People have limited time and interest and the only way to ensure that they will watch is to have at least one ranked team involved. Still, at the end of the day, being ranked in the preseason poll has never won a team a game. Just ask Kentucky from last year. What will ultimately matters is the performance on the court. But don’t say rankings don’t matter. They may not be responsible for a team’s record, but they go a long way to determining the health of a program. ← How much do freshmen play for Buzz Williams? Thank you – great stuff as usual. As a footnote, that does not change your thesis one iota, Red Hickey turned down a NCAA tournament invitation, in either 56 or 57, because he did not believe the Warriors were good enough.